At Bernell Hydraulics, we are proud to be your best Inland Empire source for Parker hydraulic pumps in Fontana CA. We stock lots of Parker pumps and accessories, and whatever we don’t have we can order for you. If you need help choosing a pump or want more information about various Parker products, our knowledgeable sales staff can help. And if you need your pump installed onsite, we can send a mobile field technician to assist you. Because the hydraulic pump is like the heart of a hydraulic system, pumping fluid into an accumulator where it becomes pressurized and can then provide mechanical power to the rest of the system, choosing the right pump is essential. Parker hydraulic pumps in Fontana CA can help you get the best performance and efficiency out of your machine. 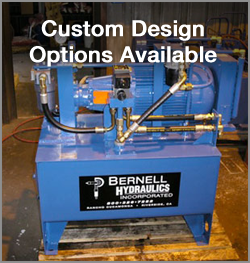 At Bernell Hydraulics, our expert staff can help you weigh the various factors surrounding your choice of pump, such as the optimum pressure and flow rates and the overall ruggedness of the system, as well as the presence of any special features like digital sensors and self-regulating capabilities.